Between 2000 and 2005 there was growing awareness and understanding of interactions between seabirds and deepwater trawlers (e.g. greater than 28m in length) and, in particular, behaviours that lead to a risk of injury or deaths through trawl warp strikes. Seabirds are attracted to opportunistically feed in close proximity to factory trawlers, particularly where there is offal and other processing waste in the water at or near to the surface. The seabirds principally at risk of warp strikes are mollymawk species, a group of medium-sized albatrosses that form the genus Thalassarche (e.g. white capped albatross). The subsequent implementation of a range of effective mitigation measures, including mandated seabird ‘scaring’ devices (tori lines and bafflers) and industry-led programmes to reduce fish waste attraction for seabirds, has resulted in a significant decline in the numbers of fatal interactions between seabirds and trawl warps. As net captures are proving more challenging to resolve and are now the primary cause of seabird captures, attention has refocussed on how to mitigate these captures in the trawl net when this is near surface, during shooting and hauling. Government observer reports show a change from 80% warp caught and 20% net caught in 2005-10 to 10% warp caught and 90% net caught in recent years. A large proportion of the seabirds at risk of net capture are diving birds (approximately 50-80% of all net captures with high interannual variation), the majority being white-chinned petrels and sooty shearwaters. However significant numbers of albatross are also caught. The numbers of these birds caught each year (estimated at 750-1,000 per annum), even though 30-60% are released alive (fate unknown), is sufficient to warrant continued efforts to reduce the risk of interactions with near-surface trawl nets. Mitigation options for net captures are limited, with reduced gear time on surface, removal of food attractants and net binding (for midwater trawls) being amongst the few options in use or available. Bottom trawls have twice the catch rate of midwater trawls. One solution to reduce the risk of seabird net captures would be to deter seabirds from entering the general area to the aft of the vessel out to about 150 metres while the gear is on or near the surface during shooting and hauling. The questions are: How to achieve this? And, Is this even possible? 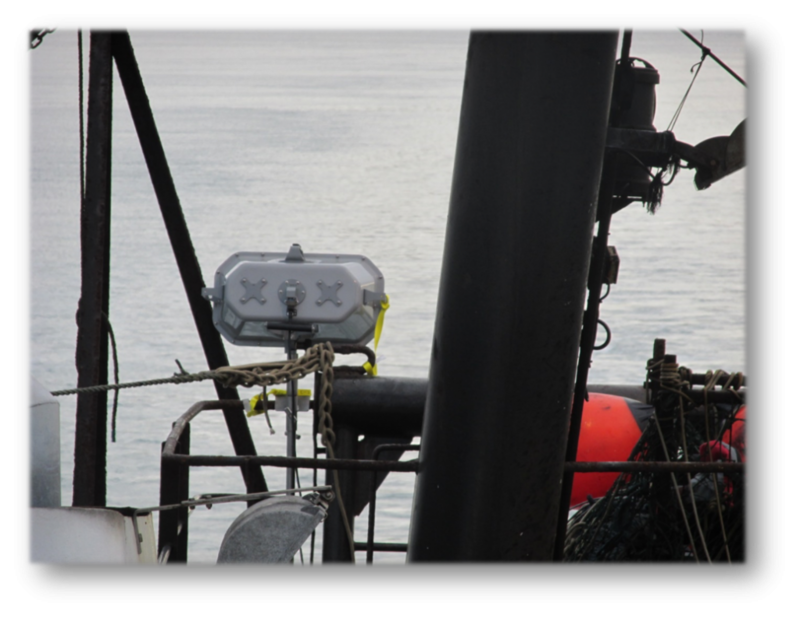 Acoustic devices, such as sonic and gas cannons (as have been successfully used in viticulture), have been trialled or used at sea in various fisheries, usually with minimal or short-lived effect and often at the cost of annoyance and risk to crew. Recent developments in directional projected sound devices for crowd and pest control raised DWG’s interest in assessing the efficacy of acoustic deterrence considering this new technology. One area of potential is Long Range Acoustic Devices (LRAD) that broadcast audible notifications and warnings over distance. LRADs have been used to deter wildlife from airport runways, wind and solar farms, nuclear power facilities, gas and oil platforms, mining and agricultural operations, and industrial plants. While we have not been able to identify any documented reports of their efficacy on seabirds, they are reportedly used successfully to deter flying foxes in Australia, whose roosting habits cause community angst. DWG sourced trial equipment, along with an experienced operator, from LRAD Corporation agent in Sydney (https://www.lradx.com/) and has undertaken at-sea trials onboard trawlers in New Zealand waters. DWG identified an agent for LRAD in Australia. Stage one was to test their smallest and cheapest device (approx. AU$10k) on a coastal trawler on seagull species to assess its deterrent effect. Stage two tested a larger and more powerful device on a deepwater trawler on albatross species. 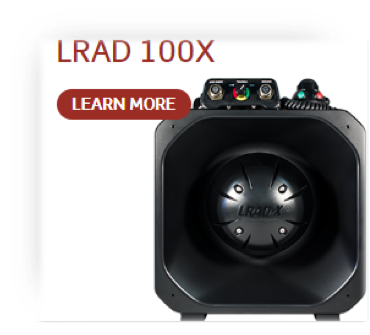 Model tested was the LRAD 100X (https://www.lradx.com/lrad_products/lrad-100x/) which we expected to project sufficient noise (dB) out to 100-150m distance from the vessel. The trial was undertaken in Tasman Bay onboard FV Dorothy May on 19 June 2018 on a calm clear day. The vessel was attended by black backed gulls and red billed gulls. The device was held by the operator at the transom and directed aft toward the birds. 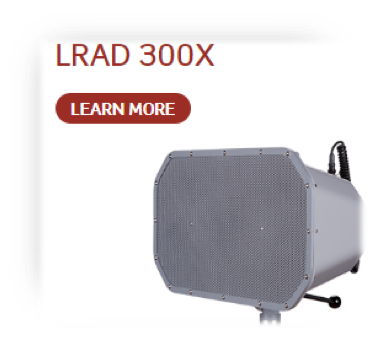 A second trial was undertaken with the LRAD 300X (https://www.lradx.com/lrad_products/lrad-300x/). This is the largest portable version of the LRAD models and costs approximately AU$30k. Based on its specifications it was expected to produce effects out to 200-300m distance from the vessel. The trial was undertaken in Cook Strait onboard FV Otakou on 24 July 2018 in calm clear conditions. The vessel was fishing for hoki and attended by around 500+ Salvin’s and whitecapped albatross at the time of each haul. The device was deployed in a tripod on the vessels fantail (see cover picture). Video footage was taken of both trials and paper data forms were completed for each tow in Cook Strait. For both trials, the agent operated the equipment at all times and was able to introduce a wide variety of different sounds via iPhone connected to devices. During both trials, at all times when the LRADs were in operation, hearing safety equipment was worn by personnel and crew on deck. There was little to no noticeable deterrent effect on gulls, even when these were attracted alongside the vessel with fish offal. On one occasion, birds wheeled away but returned immediately. In the last of a sequence of events, gulls within 10m of the vessel’s stern were treated to full volume noise to no visible effect. Three shots were undertaken when trials ran. There was essentially no discernible deterrent effect from the device across a range of sounds at full volume when birds were aggregated at the codend when it surfaced. On only one occasion, when the codend and birds were within 10-20m of the stern, was a “wheel away” fright behaviour observed. However, the birds returned immediately to the net. 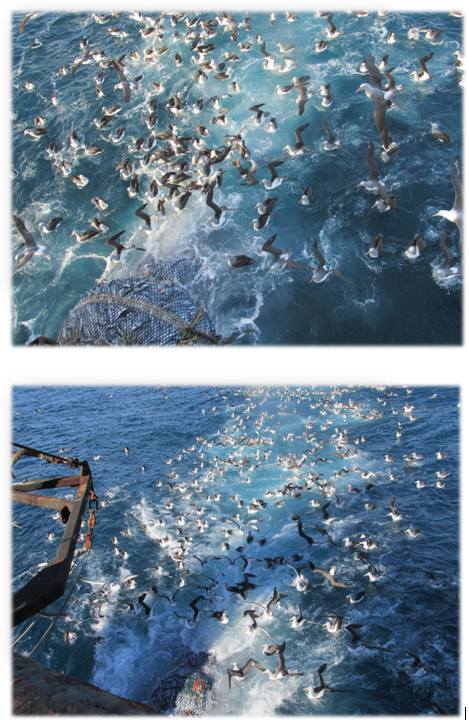 Pictures below shows birds in attendance as codend enters ramp while the LRAD was activated. It was noted on the coastal vessel that the noise was “unpleasant” in the wheelhouse. 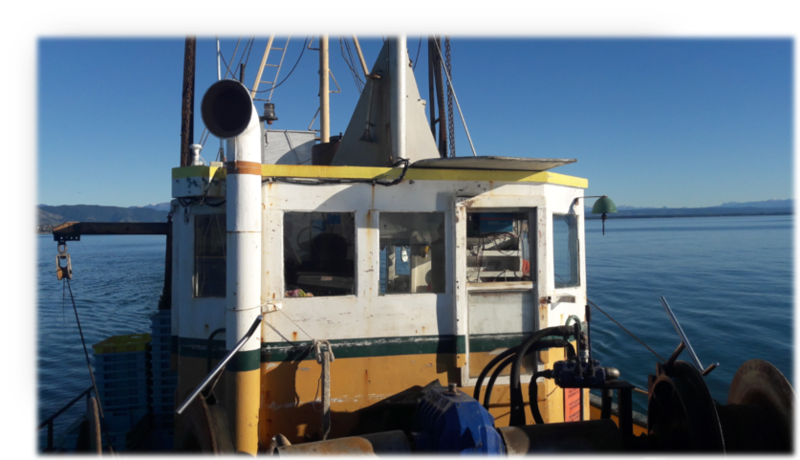 Deck crew on the larger vessel advised that the noise was “very loud” if they took off earmuff or earplugs when working nearby the LRAD in the transom area on stowing the trawl doors etc. No birds were caught during the trials. Total costs for these two trials including all travel, equipment, vessel and personnel costs were just under $9k. The first trial led to the view that the efficacy of this LRAD device was very low, at best, for this application. Given the need to mitigate the risk to seabirds of capture in near surface trawl nets, and the low costs to undertake further LRAD trials, we decided to trial a second more powerful device in a scenario with more seabirds. The LRAD agent confirmed that he did not see this as a “saleable” solution for us. Review the application and efficacy of LRAD devices as a deterrent for terrestrial birds (e.g. at airports) and elsewhere globally that may show promise of application to mitigate the risks to seabirds from net captures in the New Zealand situation.